Two hours after arriving in Sweden Disa and I were pulling plastic at her local gym. Half an hour after that, I had fallen asleep belaying her. Thank goodness for GriGris. A short afternoon nap helped me fight jet-lag, and in the evening we had dinner and board games at her friend Carl's house. A casual dinner party with strangers - yeah, I'm back in Sweden. The next morning we met up with Erik and went to a vegan fair, complete with buffet (vegan fare at the vegan fair?). We enjoyed our foods and went for a walk around town. Erik got a call during our walk asking if he wanted to go climbing. He extended the invite to Disa and I, and plans were made. An hours drive out of town took us through Swedish hamlets and farmlands sprinkled with houses all the same shade of red. Martin, our guide and instigator of the trip, parked the car on the grass by the road and we piled out. Five minutes walk away was rock sticking through the trees, perhaps ten meters at its tallest point but running a good length into the forest, where it disappeared. The routes were well bolted, short, and crowded. There was clearly no more room for development at the wall, and attention had to be paid to not clip or climb the adjacent route. We warmed up on a 6a that bucked me when I climbed off route, then another 6a just next to it that I hardly remember even though I'm writing this only a day later. Next, I had a proud onsight of a 6c, which makes me think it more than likely was not a 6c. I finished my climbing on one of Disa's favorites, The Twist (6b? ), where I took a bit to find my way through the crux - hint, use the jug. That put me at two for two days of climbing in Europe. Something tells me I won't make it to a three streak though. Sunday was our social day. Disa's friend and climbing partner Disa (hereforth, Kålle) had her thirtieth birthday party, and it was important I meet her as she was being kind enough to loan me camping gear for Spain. The party ended up being something of a celebration of childhood for me. After dinner we all migrated outside where we played brännboll, the Swedish version of baseball, followed by limbo, capture the flag, and finally hide-and-seek. It was wonderful to spend time running around in the sun making new friends. Monday was my last day in Uppsala, and well spent. Disa and I walked the river boardwalk in the heart of the town and spent the afternoon sat in the sun reading and walking around town. In the evening, we reconnected with Erik and climbed with him at the terrific local bouldering gym. I've managed to convince Erik to come out for some Wyoming climbing, and am working on wearing down Cissi who was also climbing with us. Who knows, July could be the month of the Swedish invasion. On our way to the bouldering gym Disa and I passed a group of people enjoying beers outside a cafe in the sun. "Ah, that looks like a great idea," I said as we walked by. 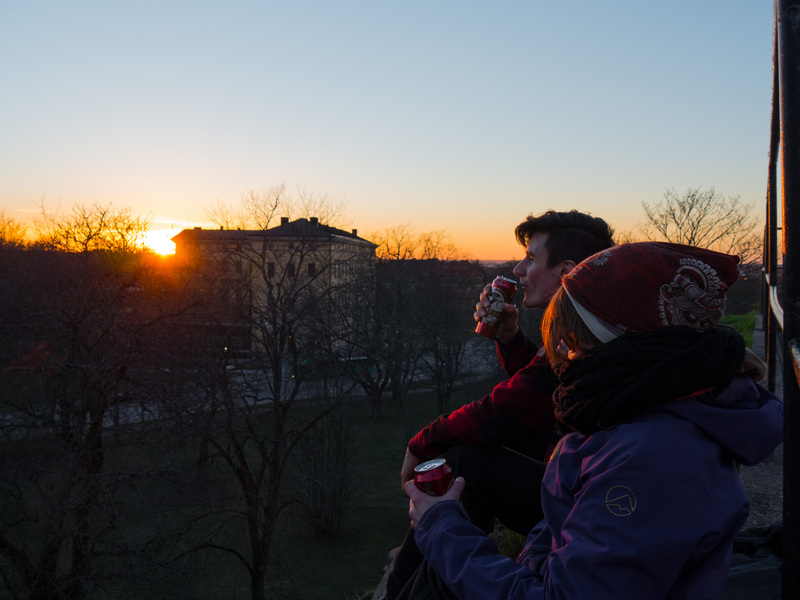 It became the impetus to grab a case of Peoples Beer (Falcon, in honor of Andrea and Martin and happy memories in Umea) and two bags of crisps and race to the highest hill in town to enjoy a two hour sunset in front of the castle.